Frieda surrounded herself with buttons and more buttons. Almost everyone keeps a container of buttons someplace in their home. At one time, many cut off the buttons on old clothes and kept them in a jar or can. You never knew when you might need an extra button. Frieda Warther did much the same thing. Buttons hung on strings around the walls of their dining room so she could reach them easily. Living in Switzerland until the age of four, the family then came to the United States and settled in Dover, Ohio. Frieda was the oldest of thirteen children. It was a Swiss tradition that the oldest child would receive their mother’s box of buttons and sewing tools. Thus began Frieda’s love of buttons. This Button House originally housed the Warther Museum to display Mooney’s trains. Today those buttons have been used in some of the designs at the Warther Button House, which is just outside Warther’s Museum in Dover. When Frieda first met Earnest Warther, called Mooney by his friends, their first date consisted of a field trip to hunt arrowheads. After marrying Mooney, Frieda became a wonderful mother to their five children and Mooney’s main support as he developed into a master woodcarver. Her main relaxation came from tending the gardens outside their home and Mooney’s workshop. She designed them to remind her of her back yard in Switzerland. When the children were young, these gardens contained many vegetables as well. Today, those flower gardens provide a peaceful place to relax with many benches available. During the depression, Mooney hid his money under the coal in this train. But Frieda knew! Mooney frequently ‘borrowed’ items from his wife to use in his carving creations. When he needed a belt to run one of his model trains, he would borrow it from her sewing machine and replace it when he found one in his journeys. He often liked to use red and green sparkling gems on his trains as well. These he borrowed from Frieda’s brooches. When visitors came to see all of Mooney’s carvings in those early days, they often spent the afternoon viewing trains brought from storage in the various rooms of their house and even the attic. Frieda decided in 1936, it was time for a museum, so they built the small museum, which is today her Button House. Kristen, great-granddaughter of Mooney and Frieda, stands on the porch of the Warther’s’ home. The porch of the Warther Home gave Mooney and Frieda the perfect place to watch trains go by on tracks just across the street. From here they could also watch their children playing in a large playground Mooney had created for them. It’s no surprise that there is a red caboose there also, since Mooney carved so many trains during his lifetime. Inside the Warther Home, you’ll learn more about Frieda and the family. They lived in their original residence for sixty-three years. This table served as Frieda’s workplace for most of her button creations. Life was busy for young Frieda, so it wasn’t until she turned sixty that she began working on her button designs at their dining room table. She began experimenting with various combinations and then attached them to a board with either wire or dental floss to make beautiful hanging designs. Beautiful button designs fill the walls and ceiling of the Button House. Mooney enjoyed her artistic endeavors by saying, “Sometimes while Frieda was working, she would drill too deep and hit our table. One look at her breathtaking designs and you will realize it was well worth all the holes.” Those holes can still easily be seen. She also used buttons to make jewelry, a button tree, chess sets and many games. Strings of buttons hung in her kitchen just waiting to be used. This picture postcard show Frieda in her Button House. Today many of those creations containing 73,000 buttons can be found on the walls and ceiling of the Button House. Here you will find buttons of many kinds of materials: hand-painted ceramic, pearl, metal and wooden. Amazing as it may sound, there are no duplicates in the displays. This button design features a button in the center from Mrs. Lincoln’s inaugural dress. One of her favorite designs has, as its centerpiece, a button from the Inaugural Dress of Abraham Lincoln’s wife. Lincoln was a favorite of the Warthers, and Mooney followed Lincoln’s philosophy of life. Because the family loved children, Frieda made one design especially for them. It consists of Cracker Jack prizes, novelties, and what she called Goofy Buttons. 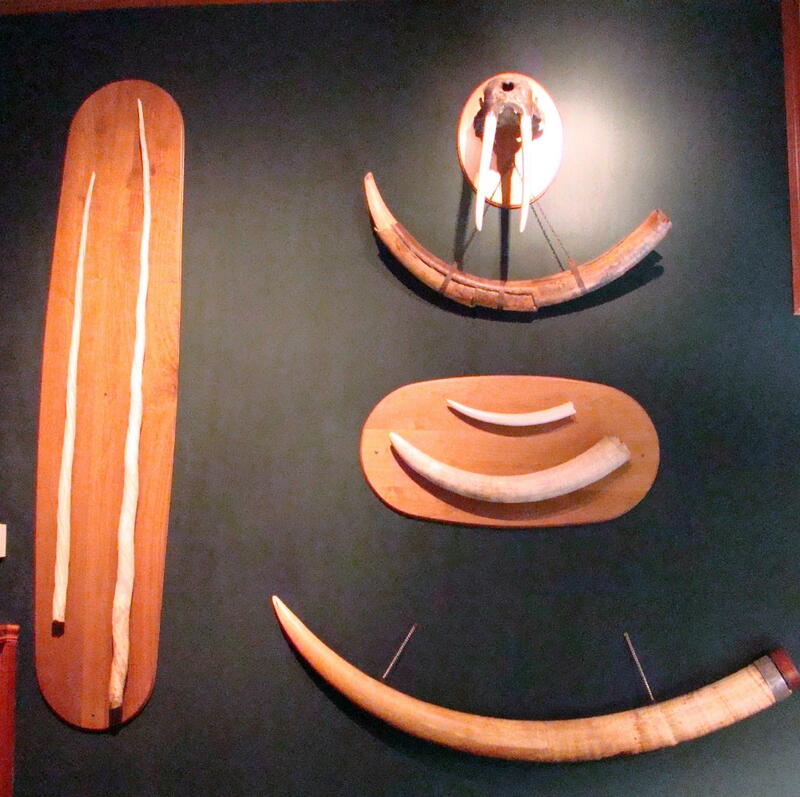 Arrowhead displays by Frieda also hung in Mooney’s workshop. If you look carefully, you can also spot her button designs in another spot – the ladies’ restroom inside the Warther Museum. Had to inquire from a gentleman visitor regarding what was on the wall in the men’s restroom. Here Frieda made a creative display of Mooney’s arrowheads he found on his trips to the country with their family. You never know where creative objects might be found. The back of a button display was shown by Sheila, our guide and daughter of Mooney’s barber. There are still unfinished patterns that Frieda had planned. Even when she was in her final days at the age of 98, she was still asking people for one of their buttons if she saw an unusual one. Soon thousands of springtime tulips will be blooming in Frieda’s Swiss Flower Garden. Many of the spring flowers were originally planted by Freida. Stop by and relax on a bench and imagine what it would have been like to live at “Dumb Street” along the Calico Ditch. Warthers Museum can be found easily off I-77 in Dover, Ohio. Take Exit 83 to the east and follow the well placed signs to Warthers. Early in life, Ernest, called Mooney by most who knew him, worked for the railroad. When he began whittling, it seemed natural to use his passion to create the history of steam engines with moving parts. During his early years when money was scarce, Mooney used chipped and cracked cue balls made of ivory for his trains. When he rode his bicycle around town, he would often stop at pool halls on his trips to a favorite spot, Woolworths. Cue balls, walnut, coal, mussel shells and beef bone formed his early locomotives because…they were free. At this point, he no longer called it whittling, as now he carved trains to perfection. 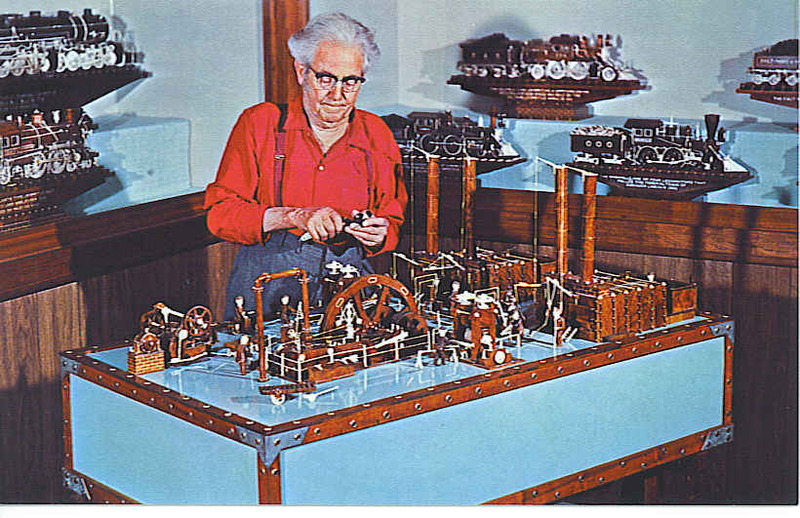 His intricate designs were displayed in New York Central Railroad and later in their traveling road show, Famous Warther Models, that carried his engines to the forty-eight continental states during its thirty year run. Completion of one carving at a time was the order of business for this mathematical and mechanical genius. While Master Carver Mooney used walnut wood and soup bones for his early carvings, he later used ivory for the white parts of his trains and ebony for the black. None of his trains were glued, but parts were intricately pegged together. 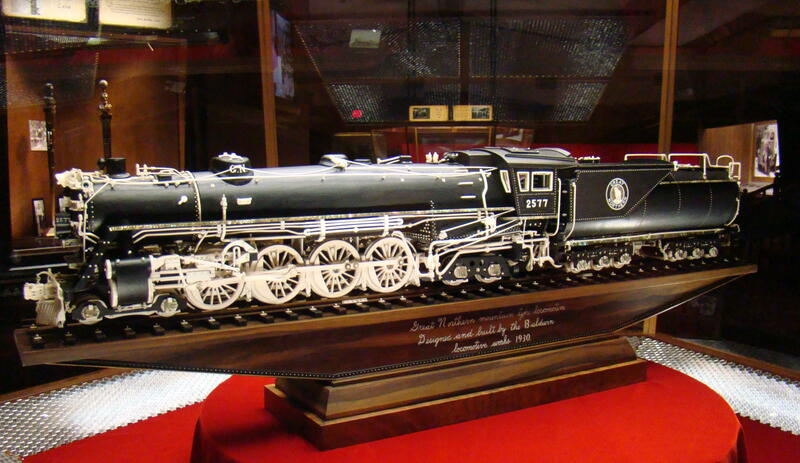 Mooney carved one of his best and favorite replicas, The Great Northern Locomotive, in 1932-33. The cursive words on the side were all hand carved out of ivory – each word a solid piece. 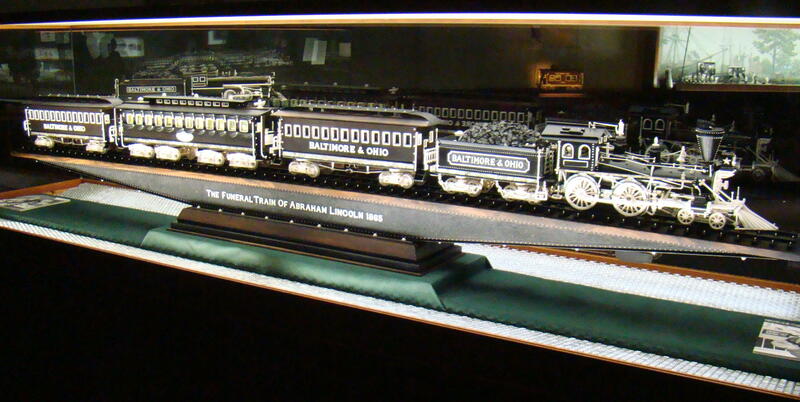 The number on the side of the locomotive represents the number of pieces used – backwards; therefore, this carving contained 7,752 pieces, many of them moving. A hobo at the train station told him about a self-lubricating wood, arguto. If Mooney used this hardwood on the bearing surface, the parts would never need oiling. Those trains built with arguto still run smoothly today nearly 80 years later. Mooney enjoyed the neighborhood children stopping by his workshop. He kept a brick outside his workshop door. When children would stop by and ask Mooney to play with them, he had a quick answer. “If I throw up this brick and it stays in the air, I have to work in my shop.” The children adored him. The eyetooth of the hippo, the finest grade of ivory, was used in the famous Lincoln Funeral Train, which Mooney carved at the age of eighty. Being a big fan of the history and philosophy of Lincoln, he paid tribute to him by carving his funeral train on the 100th anniversary of his assassination. Since it was often difficult to find the treasured hippo ivory, he then settled for the second best – ivory of a walrus, and even third- that from an elephant. Much of the ivory came from baby elephants when they lost their baby tusks. You can imagine the excitement at the railroad yard as the ivory was always delivered by train. The last carving completed was Old Ironsides in 1966. Mooney always tried to be accurate in his scale models and often used 1/2″ to a foot. Speed never figured into his carvings, as he might carve about 1,000 small pieces a month. Warthers can be found easily off I-77 in Dover, Ohio. Take Exit 83 to the east and follow the well placed signs to Warthers. World’s Master Carver Ernest Warther spent a life-time in Dover, Ohio. When Ernest was three years old, his father died leaving the children to help support the family. While the youngsters were unable to attend school regularly, Ernest’s inborn abilities surfaced by chance along life’s path. For a penny a day, young Ernest did his part by driving neighborhood cows outside of town to pasture, then returning them home in the evening. When five-year-old Ernest was driving cattle, he spotted a treasure on the ground. A pen knife! His life’s adventure was about to begin. A few years later Ernest met a whittling hobo at the local train station. This hobo could form a small piece of wood into a moving pair of pliers by making only ten strategically placed cuts in the small, rectangular, wooden block. Ernest, called Mooney by his friends, watched the hobo carefully before he headed off to another town. Soon Mooney was making these magical pieces with ease. During his lifetime it is estimated he made nearly 750,000 pairs of pliers, most of which he gave to children. His fastest time for carving a pair of pliers occurred on the Johnny Carson “Tonight Show” when Mooney finished in 9.4 seconds. 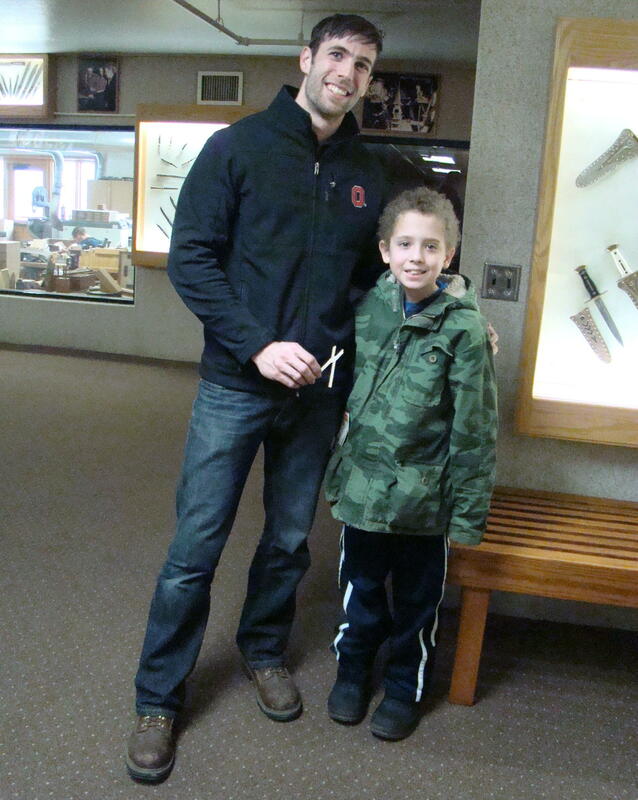 Whittling became Mooney’s favorite pasttime, now making double pliers and more. But as is often the case, one thing leads to another. What do you need the most for whittling, especially ebony and ivory? A sharp knife! That was something Mooney could not find. Sometimes the best way to do something is to do it yourself, so Mooney developed a knife that would keep its sharp edge. 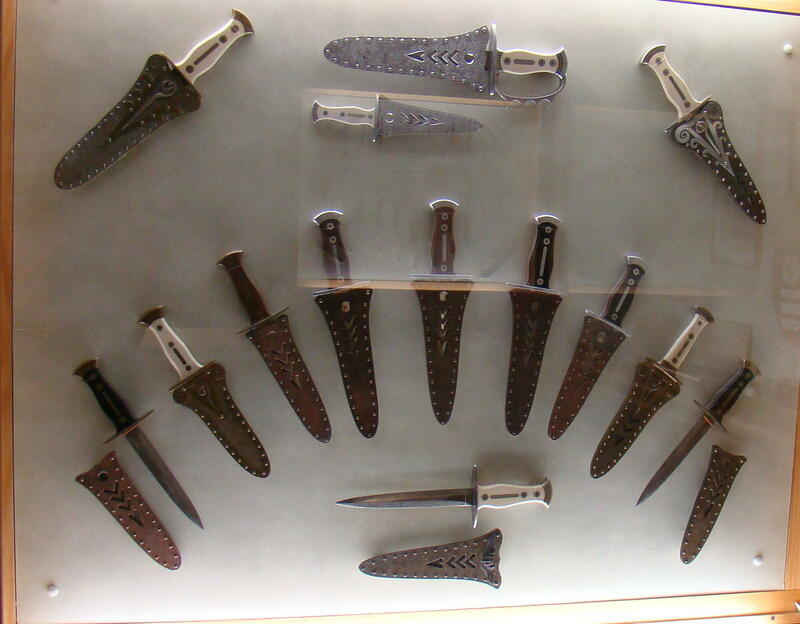 These are the knives Mooney used himself with their accompanying 139 blades. In his workshop, Mooney developed techniques for tempering and sharpening steel blades so they would hold their sharpness. For whittling purposes, the knife had to have a big handle with small blades – shorter than his thumb. His knife had 139 interchangeable blades so he could work easily with any material of any size. When his mother needed a sharper paring knife in the kitchen, seventeen-year-old Mooney created a small kitchen knife for her. Soon the neighbors were all wanting a knife just like Mooney’s mother used.He added a distinguishing trademark swirl on the blade so his knives were easily recognized. 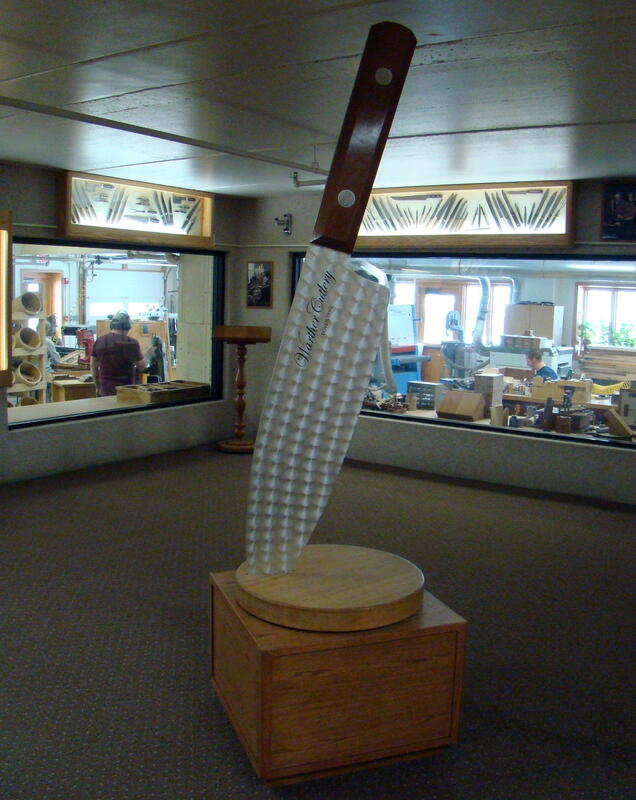 Thus began the business of Warthers Cutlery, handcrafted in the USA since 1902. Realizing his real riches laid at home, his five daily hours of carving were scheduled for early in the morning before the family awoke. After breakfast, Mooney would ride his bicycle to work at the steel mill, then spend time in the afternoon playing with the children he adored. He didn’t really care much for money; however, when the family needed something, Mooney would make knives. He never sold his carvings. In 1912, Mooney ended his whittling with a plier tree that can be seen in a glass case today.The tree was made with 511 cuts and was featured at Ripley’s Believe It or Not. This is the point where his whittling turned to carving as he began his history of the steam engine in walnut, ebony, and ivory. Commando Knives made during WWII. 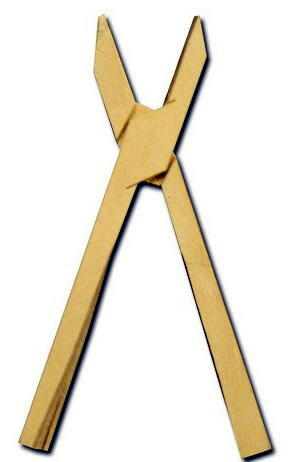 During WWII, a lady asked Mooney to make a knife for her son to carry with him during conflict. Mooney made 1100 Commando Knives during this time and carved the names of the military men into the handles. Family member, Steven Cunningham, makes pliers for children today. Today the knives of Warther Cutlery are still made in Dover, Ohio with all USA products by third and fourth generation family members. They continue demonstrating Mooney’s signature pair of pliers for visitors, with children usually receiving the newly carved pair. Before you leave, stop by the gift shop and purchase one of the Warther Cutlery knives with swirl trademark. My little paring knife, “Old Faithful”, was purchased there over twenty-five years ago and is still like new. Whenever you happen to be in the area, visit their knife shop where they will sharpen your Warther knife for life at no cost. When you stop by, they will ask you which hand you use to cut with, so they can sharpen the blade accordingly. They strive for perfection! Older residents still remember Mooney riding his bicycle down the middle of the road with his white hair flying. The basket on his bicycle was always handy for items he found or was given along the way that eventually might become part of his carvings, either mechanically or in their design. 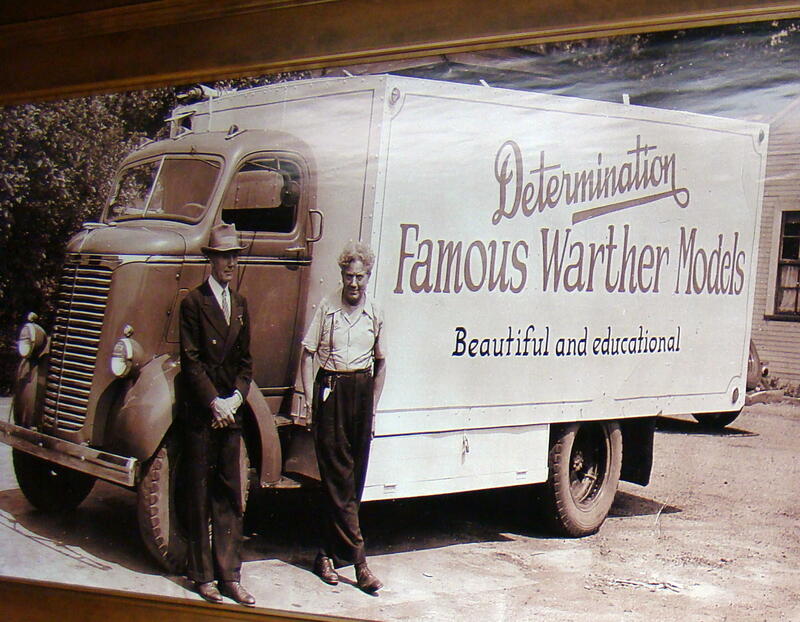 While Ernest Warther worked at his passion nearly every day for 83 years, he died almost penniless, but happy beyond imagination.